﻿In this course students examine social problems facing societies today. Topics include problems associated with deviance, crime, inequality, social institutions, and modernization. Social problems will be analyzed from various sociological perspectives to better understand their possible causes and consequences. Strategies for addressing social problems will be discussed and assessed. The professor can be contacted through the eTudes Private Message System. 1. Explain the term "sociological imagination" and discuss its relevance to the study of social problems. 2. Differentiate between objective and subjective elements of social problems. 3. Analyze how and why members of a society define a social condition as a social problem. 4. Describe and assess the basic premises of the structural functionalist, conflict, and symbolic interactionist theoretical perspectives. 5. List the stages for conducting a research study and describe methods of data collection. 6. Select research methods based on their effectiveness for describing and evaluating a specific social problem. 7. Identify and assess social problems related to deviance, such as substance abuse and crime. 8. Identify and evaluate social problems related to inequality based on race, ethnicity, gender, sexual orientation, age, and income. 9. Identify and discuss social problems related to the social institutions of a society, such as the health care system, the family, the economy, and the education system. 10. Identify and discuss social problems resulting from modernization such as urbanization, population growth, environmental issues, changes in science and technology, and international conflict. 11. Evaluate explanations given by the structural functionalist, conflict, and symbolic interactionist perspectives concerning causes and consequences of social problems related to deviance, inequality, social institutions, and modernization. 12. Assess strategies for addressing social problems related to deviance, inequality, social institutions, and modernization. SLO #1 Sociological Theoretical Perspectives - Students will demonstrate an understanding of the purpose of theoretical perspectives and apply sociological perspectives such as functionalism, conflict theory, and interactionism to social problems. SLO #2 Sociological Concepts - Students will define and demonstrate an understanding of sociological concepts, such as deviance, crime, racism, and globalization by applying them to social scenarios. SLO #3 - Strategies for Assessing Social Problems - Students will analyze causes, consequences, and solutions to social problems as they exist in contemporary society. Social Problems in a Diverse Society (6th Edition) by Diana Kendall (Pearson) - it is highly recommended that you read this mandatory textbook regularly. Participation - Students enrolled in the course are expected to complete all assigned weekly readings, actively engage in online discussions including posting video blogs regularly. eTudes has an "Activity Meter" and it will be checked regularly. Lack of online participation is the equivalent to not coming to class. 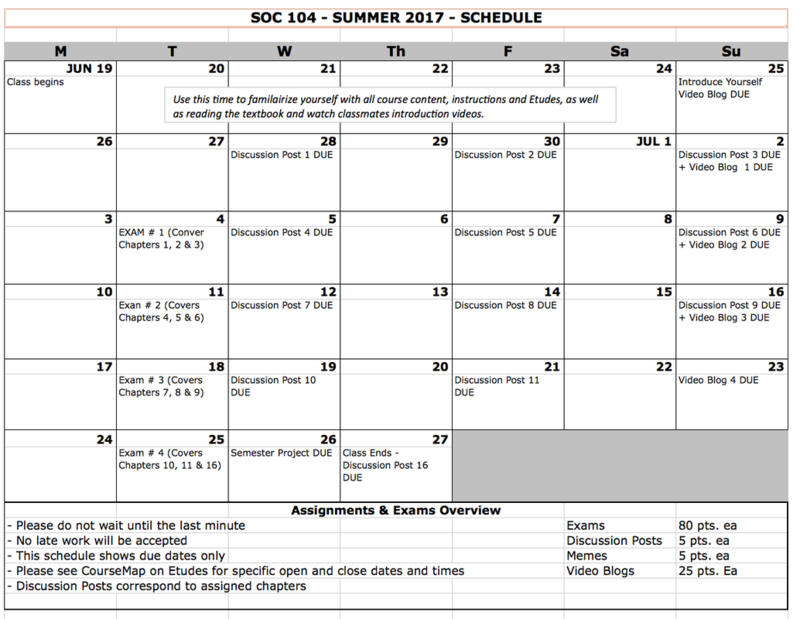 Exams must be taken within the OPEN and CLOSE dates found on the COURSEMAP on Etudes. Don’t start the exam until you are ready – once you start, the clock starts ticking. DISCUSSION POSTS (x 2 per chapter @ 5 pts. each)= 120 pts. SEMESTER PRJECT (x 5 @ 5 PTS Each) = 25 pts.